Buy 52 or more for $4.74 each. Select the perfect name for your new baby! Not sure what to name your child? Torn between a traditional family name and an up-and-coming name? Or maybe you don't even know where to start? 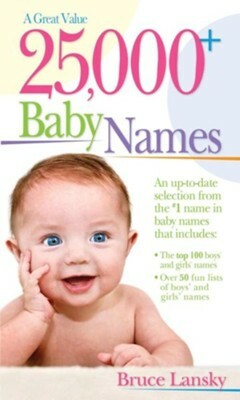 Let 25,000+ Baby Names be your guide to finding the right name! This book lets you easily scan boys' and girls' names and includes features like: guidelines for naming your baby, popular names from around the world, origins, meanings, famous namesakes, and interesting name trivia. "Katherine * (Greek) pure. See also Carey, Catherine, Ekaterina, Kara, Karen, Kari, Kasia, Katerina, Yekaterina. Ekatrinna, Kasienka, Kasin, Kat, Katchen, Kathann, Kathanne, Kathereen, Katheren, Katheren, Katherenne, Katherin, Katherina, Katheryn, Katheryne, Kathyrine, Katina, Katlaina, Katoka, Katreeka." "Noah * (Hebrew) peaceful, restful. Bible: the patriarch who built the ark to survive the Flood. Noak, Noi." Bruce Lansky is the #1 name in baby names. His baby name books have sold over 11 million copies. His name books include: 15,000+ Baby Names, 60,000+ Baby Names, and 100,000+ Baby Names. He has appeared on radio and television and in newspapers and magazines showcasing his expertise in the field of baby names. I'm the author/artist and I want to review 25,000+ Baby Names.